Yesterday, I was yet again surprised by the turn of events. It was another thing crossed off my never have I ever list. I have never had the chance to show someone clothes that I'm trying on before buying them. I usually have a good eye for things like that, so I don't ask, but it was nice to do it. It felt kind of good getting smiles that tell you "oh you look good in that dress." But yeah yesterday I did some light shopping. 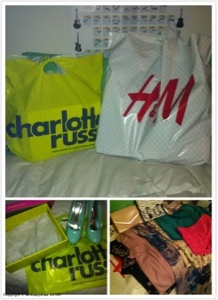 I love shopping it's my stress reliever. Although it causes my stress when I see it in my bills. Lol. Something I remembered last night was a conversation I had with him. I was saying that I was high maintenance and he reassured my saying that he was sure he can keep up. It has come to my attention that most of my adventures involved a specific person. It's nice to be able to do things I haven't done before and to be able to share it with people I care about. It's a lot of fun, and I can't wait for more memories to be shared.
" I must make you really happy if you make me this happy"